Laminar Airflow Cabinets provides a Class 100 air flow in the work area for operations where products are of utmost importance. It creates areas supplied with a continuous flow of clean air to maintain a work environment that is free from dirt, particles, and toxic or noxious fumes. Laminar work stations are designed to foster worker comfort, convenience and productivities. They provide a Class A working environment (according to GMP guidelines). The main focus of application is product or process protection against contamination introduced by many sources, such as personnel, general work area, manufacturing, performance, process, machinery, or the product itself. Reverse Laminar Airflow workstations, Clean Room Equipment, are suitable for dispensing of powder and chemicals and to minimize the risk of contaminating the work zone and ensure health safety for person working with chemicals/powder. This equipment is based on the recirculation of air and ensures that the cloud formed by the material dispensed, is sucked in a natural pattern of movement and arrested through pre-filters. The air is then supplied back at the work zone through HEPA. 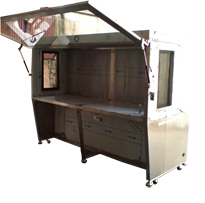 After initial cycles, we achieve class 100 hazard proof laminar movement of air and handling of material.